Venus is in double resonance with planet Earth, and it is one of best fitted resonances in Solar system. Then, Venus spin resonates with Earth orbit 12:8. Each 12 Venus days are 8 Earth years. Every time Earth and Venus meet, Venus points a same face toward planet Earth. Every time they are in opposition arround Sun, Venus points that same face toward Earth and Sun. Hence it seems, that Venus is tidally locked by planet Earth, not only by Sun (as is a case with Mercury). The other such sign of Intelligent Design is, that Moon orbit is tuned to Sun spin, which makes Earth pulse on it’s orbit in and out synchronized with Solar spin, which, by my opinion, helps to recharge Earth’s magnetosphere, that has been speculated, that it should have been long since faden away like on Venus and Mars, but surprisingly it is not… Solar spin is highly irregular, faster on equator and slower on poles, and arround latitude 40° it is synchronized with Earth-Moon pulse, and from this latitude each sunspot cycle starts toward equator – is it just a coincidence…? Interesting stuff. 12:8 = 3:2 i.e. first order resonance. Re sunspot cycles, there is evidence that Earth’s auroras are linked to them, especially around solar maximum. Auroras are known to be more prominent around the time of the equinoxes, i.e. March/April and September/October. Also, see first link under ‘Related’ at the end of the blog post. With a little arithmetic (taking inverses) we can easily convert that value to the rotation period with respect to the Sun or, in other words, to the day on Venus. It is 116.75 (Earth) days. Five of those periods equal 583.75 days, which is almost the same as the 583.92 day synodic period. So each time the planets line up Venus shows almost the same face to the Sun and hence the same face to the Earth, which is always on those occasions on the opposite side of Venus. From: Are transits and the rotation of Venus linked? And so, astronomers have decided to measure the rotation rate of the Sun from an arbitrary position of 26° from the equator; approximately the point where we see most of the sunspots. At this point, it takes 25.38 days to rotate and return to the same spot in space. P A Semi’s post above is of particular interest (but short of needed understanding on my part). Tks. Question: My target is the Eddy cycle (980y); its origin. Wiki says Earth Venus resonance is 1000y. See table in Link: https://en.wikipedia.org/wiki/Orbital_resonance . P A says 1100yrs. Any more light here please? It also shows, that there is not a sharp pentagram, but rather an oblique rosette-like shape. About 1100 years: I’ve written this from my faint memory. In my work (pdf link above) there is 1199 years for full turn of the meet-point shape, but since the shape is made of 5 symmetric meet-points, to rotate it one fifth of circle takes 243 years. About wiki/Orbital_resonance – I’ve tried and abandoned to add the mention of these resonances back in 2009, it was actively censored. Only some time later someone added the paragraph about “Coincidental ‘near’ ratios of mean motion”, which contained thesis, that these “have no dynamical significance”. Ian Wilson commented on the 251 year period here, and the figures and explanation are in the related post. The data is from NASA. Re Wikipedia, the ‘gatekeepers’ there don’t seem to want any planetary ideas except their own to get any attention. But the Venus transit page is still quite interesting. It would be useful to identify what force causes a planet to rotate in the first place. Inertia, defined as the ratio of gravitational force versus equatorial acceleration, is highest for Venus among all the planets. It is nearly 57K times that of Earth, and nearly 7 times that of Mercury. Saturn has the least, having the largest volume to mass ratio of any body in the solar system including the Sun. Conversely, Mercury, Venus and Earth all have a volume to mass ratio very close to each other. The ratio of rotational velocity versus gravitational force of Venus is also highest among all the planets. What this suggests is that Venus is the densest of all the planets, its mass being composed of heavier atomic elements, and such elements tend to resist the force causing rotation. It is erroneous to say that the planet would spin faster and faster, absent a counter force. No body being driven to rotate will do so at a rate faster than the velocity of the driving force. Inertia makes the planets rotate. The original dust-cloud, from which solar system formed, was rotating, and while contracting to a planet, the preservation of angular momentum makes the rotation faster. Then there does not need to be any other force to sustain rotation. The mass itself does not resist rotation, just to make rotate heavier mass requires more angular momentum. Venus is not that much heavier, how much slower it rotates, it had to be braked down. Adding external heat causing clouds to transfer angular momentum to hills and planet body can probably speed-up the rotation, though. After all, conservation of energy including conservation of angular momentum requires, that speeding or slowing of rotation must bring some energy in or out (or change mass distribution), and considering adding Solar radiation energy, that would not be radiated away all, converting to spin angular momentum is probably not that far-fetched. About Venus velocity (you write: “No body being driven to rotate will do so at a rate faster than the velocity of the driving force.“) – driving force of clouds said above to rotate in 4 earth-days is sufficiently higher than ground velocity of 243 earth-days, so this condition holds. But as I’m convinced, that the 12:8 resonance of Venus spin with Earth orbit is not a momentary coincidence, hence Venus does not speed-up on longer terms. Probably tidally locked – by Earth? Moon is tidally locked with Earth, having the heavier half pointing outward… (Which somehow surprised me, I thought that the heavier half is that pointing toward Earth, but very probably it is not… Didn’t I confuse it?) It was also initially spining faster than orbiting and to brake that spin down, it had to transfer the angular momentum energy elsewhere – to planet Earth. By an assymetry of shape, since spherical body cannot transfer angular momentum. Well that was a very interesting, and provocative, article from which I have learned a lot of things I didn’t know. Thanks for putting it up Roger. Then I go to the comments and learn even more, and such surprising stuff too thanks especially to P.A. Semi for such information. Does anybody have any idea why the atmosphere is rotating so much faster than the planet, where does that energy come from? I am assuming it is the sun but by what mechanism? Every day I seem to discover more information that only seems to serve to show how little I know. Despite trying to add to what I know for the last seven decades I feel like I understand less and less. Thanks everybody for sharing your knowledge and insights. @ P A Semi. T Y for the info. Much to digest, — with more than one lead. On a hunch I had tried looking into ‘orbital resonances’ for a possible likely ‘controlling gremlin’. Earth Venus looked like a good candidate. As in my piece the Eddy cycle with a 53year spread (if I understood correctly) suggested an external forcing/trigger, but firing irregularly (geological disasters depend on several factors besides an external orbital catalyst). On X-flow (zonal) chart it is visible, that southern part is red (faster) and northern blue (slower). There is also visible the torsional oscilation wave of slower and faster rotation, where the faster rotation (prograde wave) corresponds with sunspots. Further thinking about Venus and clouds – corriolis force makes most Earth clouds move from west to east (except near equator). On Venus, there should be opposite corriolis force, albeit much weaker than on Earth due to slower planet rotation. Then the polar vortexes on Venus could stir to spin all dense clouds from poles to equator? But how could solar radiation make the clouds to spin and thereby transfer radiation energy into angular momentum? Of course most regular-shaped moons of solar system planets have synchronous rotation i.e. 1 orbit of the planet = 1 rotation of that moon itself. Mercury’s spin is tied to its orbit period too – 3 spins = 2 orbits. Regular-shaped moons, that have synchronous spin and orbit – are probably all somehow asymmetric, unless they are all molten, which they are probably not. Why does the drag between the surface and the atmosphere not cause the atmosphere to slow down. Why does it cause the much more massive planet to speed up. What dives the atmosphere to rotate faster than the much planet in spite of the drag. Our neighbour is just plain weird. 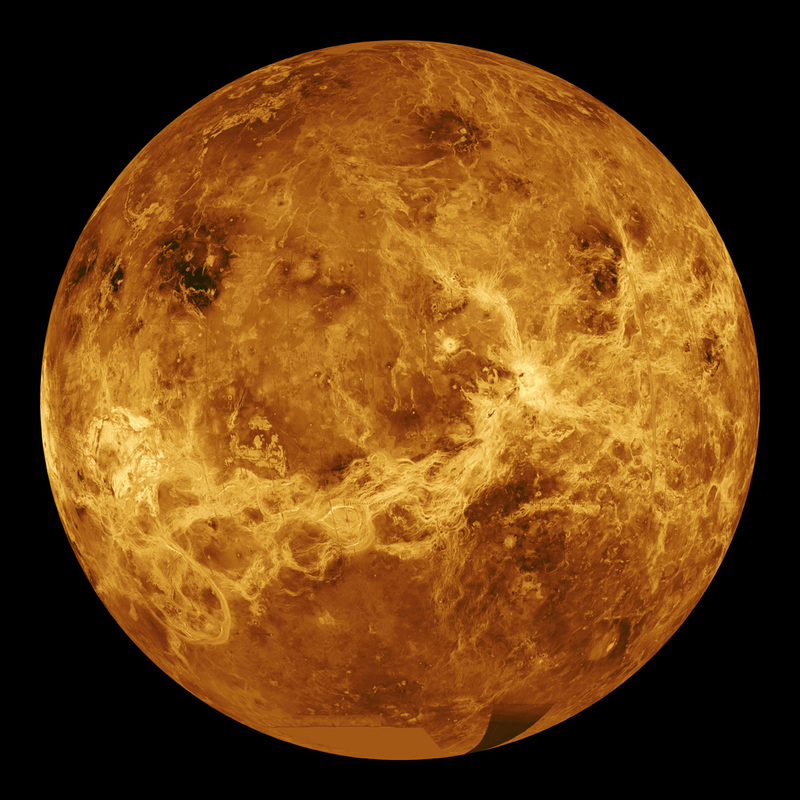 Ferdberple – and why do you think the Venus atmosphere is not slowed down? Of cause, the conservation of energy must hold, and if planet’s spin is altered, something else must lose the angular momentum, which is the atmosphere. Energy is added to the system by solar radiation.